As the end of the year draws near, I find myself inevitably drawn to crafting. Perhaps it’s the cooler, wetter weather (except here the weather is still warm and sunny and the best it’s been all year). Maybe the seasonal shifts are ingrained in me regardless of the actual temperature. Or perhaps it’s the approaching holidays which all revolve so strongly around bringing family and friends together indoors, and decorating for the occasion. Early autumn is the time to collect the cones. Don’t wait until December to go hunting for some because they’ll probably all be gone or be rotten or half-eaten. Look for pinecones which have landed on dry, relatively hard ground. If the ground underneath the cones is soft (so the cones sink in) or damp, they are much more likely to be rotten, moldy, or have bugs in. Be picky. Check each cone carefully for signs of loose or missing seeds or debris stuck in between the seeds. This affects the appearance of the cone, obviously, but also can be a sign of a bigger problem. 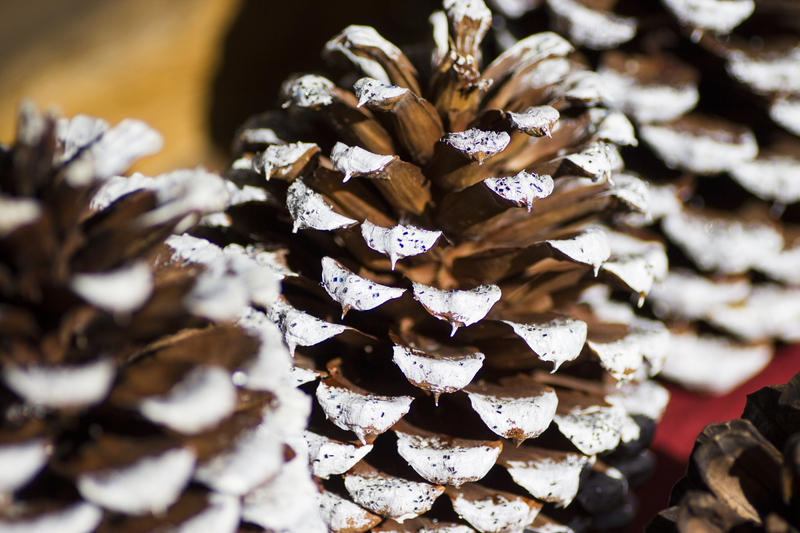 Don’t take home pinecones with mold, moss or lichen growths on them, or pinecones with any signs of bugs in. When you get the pinecones home, it can be a good idea to bake them in the oven just to be sure you’ve killed any life you missed. Put the oven on low, around 200F should be high enough to kill most things. 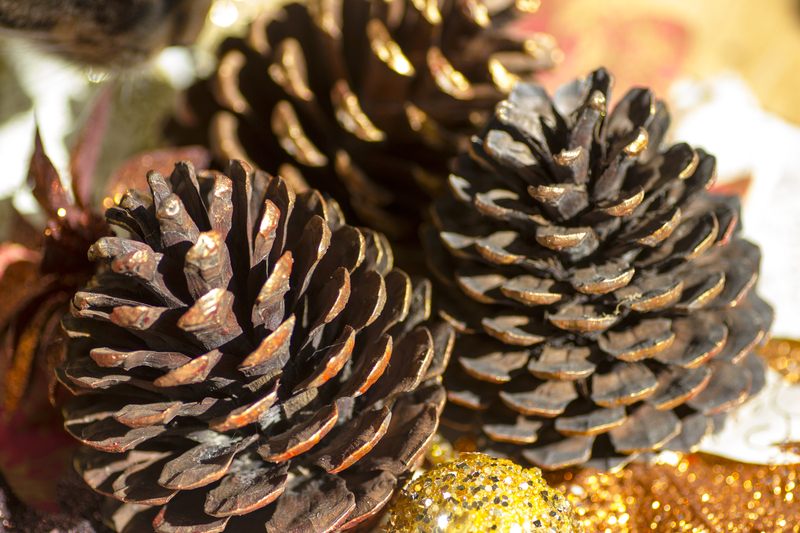 Store your pinecones in a dry place, damp can encourage them to go moldy. I decorated my cones in 2 different styles. The first one is a subtle, metallic, ombre effect perfect for autumn. I’ll bring these out in October and use them for Halloween and Thanksgiving and probably keep them out till January since they’ll work just as well for Christmas. Squeeze some gold metallic paint (I used acrylic) onto your palette and then squeeze some oranges/reds/browns around it (or choose your own color scheme!). Mix each section with the gold, leaving some unmixed gold in the middle, and then blend the edges of each section together. Don’t overthink it. 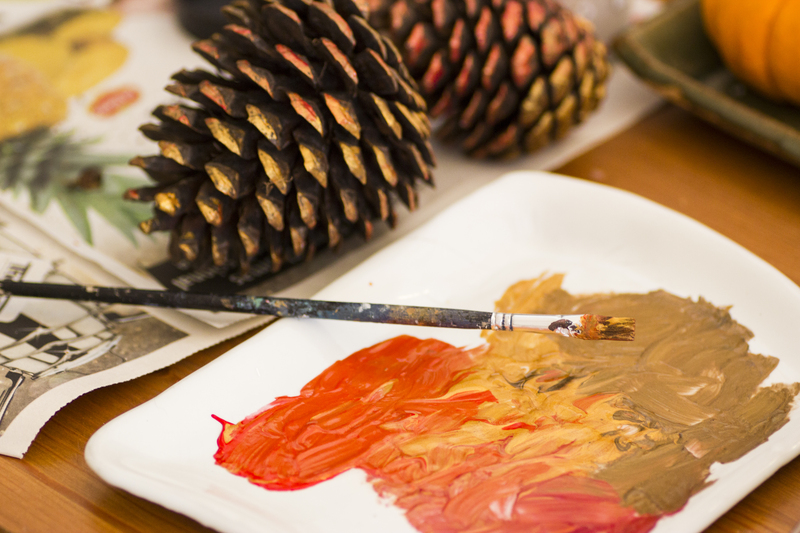 Turn your pinecone upside down and paint the bottom, and stalk if there is one, whichever color you prefer. Then, make sure there’s no excess paint on your brush and take it in long, sweeping strokes across the cone. This will preserve any interesting textures on the backs of the seeds. Each time you pick up more paint, pick from a different area on your palette so you get a slightly different shade. Leave the cones to dry and then use them in whatever arrangement you like. I cut some maple leaf shapes out of pretty paper, laid them out on a nice plate and arranged the cones on top. Simple. The other style of pinecone decoration I tried is something a lot more wintery. These are intended to look more like snow has fallen on them, and are probably the closest I’ll get to snow unless we go on vacation! This time you want your pinecone upright and you just want white paint. Paint the tips of each seed, think about which parts are exposed enough that snow would land on them but don’t worry about being too precise. You can also use spray paint for this, it’ll be much quicker and easier to get the right parts. Allow the paint to dry and then paint over it with glue. Depending on how quickly you work, you may want to dilute the glue a little so it doesn’t dry before you’re ready for the next step. Either way, it’s best to do one pinecone at a time for this part. Take a fresh piece of paper and fold a crisp fold down the middle then reopen. 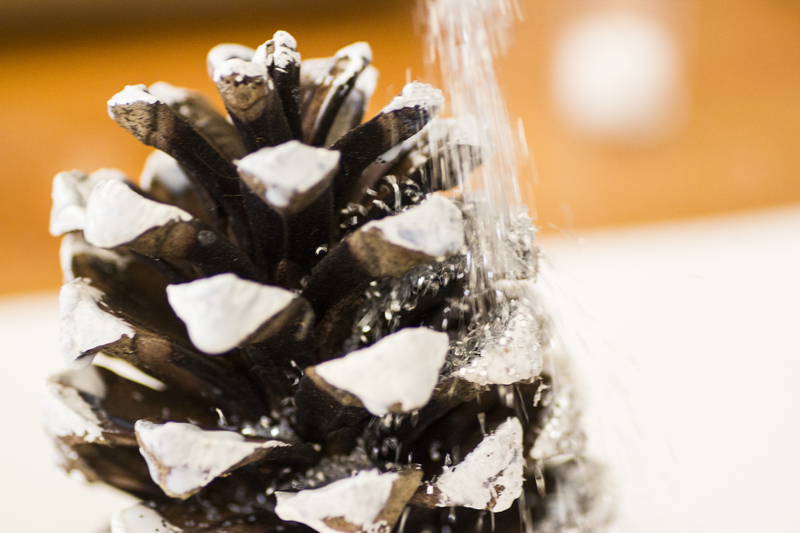 Put the pinecone on the paper and sprinkle with glitter. I used a mixture of silver and white glitter for a (fairly) subtle effect but you could go with blue or just go crazy. When you’ve covered the whole cone, turn it upside down and shake out any excess glitter back on the paper. Put the pinecone somewhere to dry and pour the glitter back into the pot. I love decorations like these which add just enough extra decoration to something natural so the end result is still rustic but shows you put some effort into it. 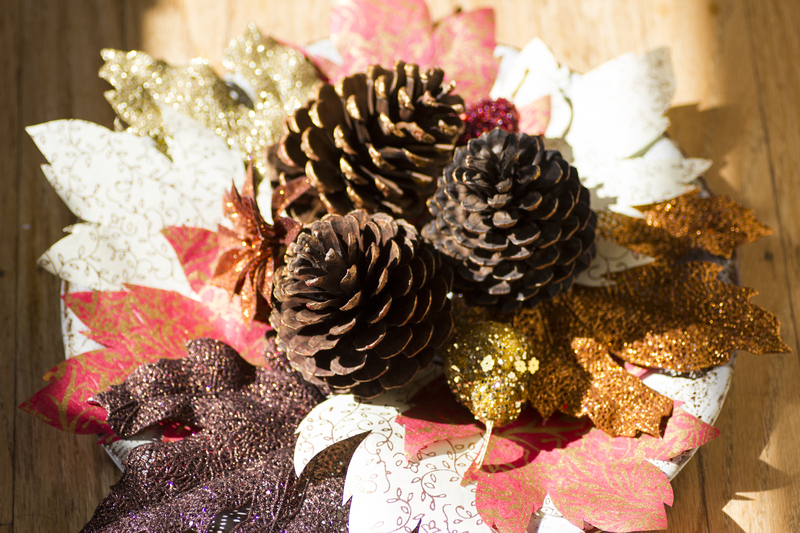 This entry was posted in Crafts and tagged Autumn, Christmas, Decorations, Nature, Pinecone, Thanksgiving, Winter. Bookmark the permalink.